This is the huge reclining Buddha with its pearl feet together at the far end. When you enter this temple, after you take your shoes off and place then in a mesh bag to carry with you, you are able to walk almost all the way around the grand Buddha. Walking in you start at the head facing front and walk down to the feet. There are displays along the walls with the history and places to pray. 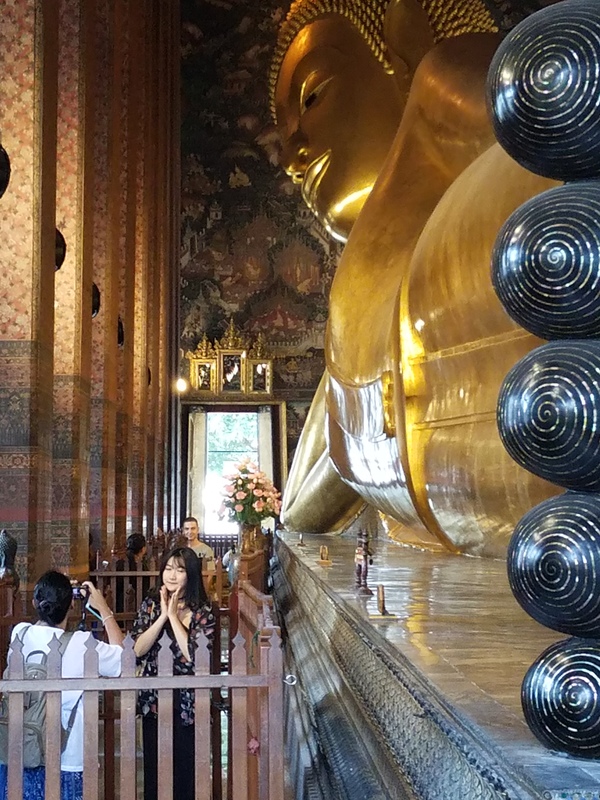 When you finally wrap around the feet and start walking towards the head you will hear the tink tink tink of coins going into medel pots all down the wall makes a wonderful and unexpected background when seeing this giant golden reclining Buddha. This video is the only way I could think to show the scale of this Buddha.